This is another in a series of looks at key Persian rugs. Kermans are one of the most commonly encountered hand-knotted rugs. In 1270 Marco Polo praised the carpets of Kerman as a marvel to see, and his description is still apt today. The city of Kerman is on an oasis located in southeastern Iran. Kerman has been a celebrated center of workshop weaving since the Safavid era (1501-1732). Weaving is performed in Kerman and several towns and villages in the vicinity. The traditional Kerman designs consist of Shah Abbas medallions, all-over boteh, striped design, panel-garden, tree-of-life, prayer, vase, hunting animals and elaborate pictorials using both Persian and European themes. Common colors include rich red and red-blue. Kermanshah and Laver Kerman are names given to particularly fine examples of old rugs from this region. Laver is a town 50 miles from Kerman. The rugs there were woven on triple-weft cotton foundations with a Persian knot. The wool used for the pile was of excellent quality and knot counts were high. The end of the Safavid era was brought about by the invasion of Persia by Afghani tribes (history seems to repeat itself). The war resulted in the disruption of commercial weaving in the country. As in many other weaving centers in Persia, commercial production was finally reintroduced to Kerman in the late 19th Century, with an emphasis on making carpets and rugs of curvilinear design. No flowers grow in this barren desert, so the weavers covered their carpets with beautiful and intricate floral patterns in a wide variety of designs. Kerman became one of the most important carpet-weaving areas with a consistently high reputation for technical quality andimaginative designs. By the turn of the 20th century, Kerman carpets were among the finest and most expensive of all Persian weavings, and by 1920 many British and American companies had offices in Kerman including major producer Atiyah International, based in Portland, Ore. Approximately 80 percent of Kerman’s production at the time was exported to America. A crucial factor in this success was the presence of skilled weavers and designers, who worked on the production of fine, multicolored wool shawls woven in intricate, subtle and colorful designs based on the floral-boteh motif. As the shawl industry declined and demand for carpets increased, these craftsmen quickly learned to adapt their skills. 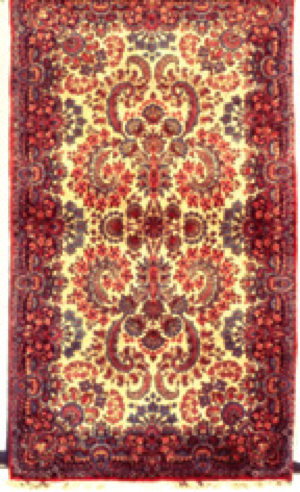 1890 to 1920 – Kermanshah- and Laver Kerman-quality of rugs, which have a thinner clip to the pile than later production. 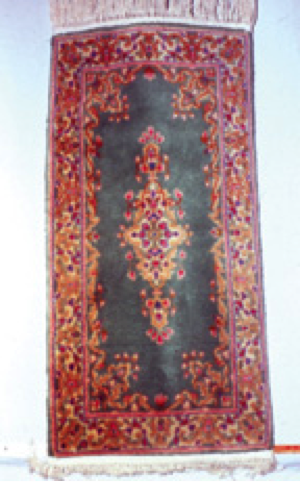 1920 to 1950 – Rugs are woven with “jewel tones”; ruby red, emerald green, sapphire blue, etc. (Photo 1). 1950 to 1975 – Pastel shades of green, pink, ivory, gold and blue are popular. Rugs have broken borders and a French-style influence. Compared to earlier production, a thicker dryer wool with a heavy “feel’ is used (Photo 2). Today, Kerman produces distinctive carpets and rugs primarily in highly floral medallion or all-over designs. 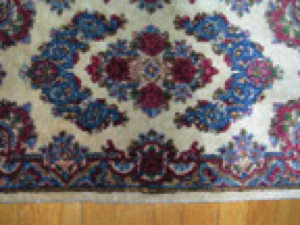 Kerman rugs have borders that are often decorated with patterns similar to those used in the main body of the carpet (Photo 3). It is not unusual to see 15 to 30 colors used in a single rug. More recent rugs tend to have pastel colors such as green, pink, ivory and blue. The patterns are almost always curvilinear, with the exception of the Kerman pictorials. The open field is actually on important distinguishing characteristic of modern Kerman rugs. With regard to cleaning, Kerman rugs have been chemically washed, most quite heavily. This can result in color changes or dye loss when using aggressive spotting agents or rust removers, which can bleach the dyes. Generally, Kerman rugs clean well and do not suffer from dye bleed, but performing a colorfastness test is always recommended. Learn to recognize this popular rug. It will show your customer you have more than a passing interest in their prized possessions.